Shirt and Top with roll up sleeves made in King Cole Opium Palette. 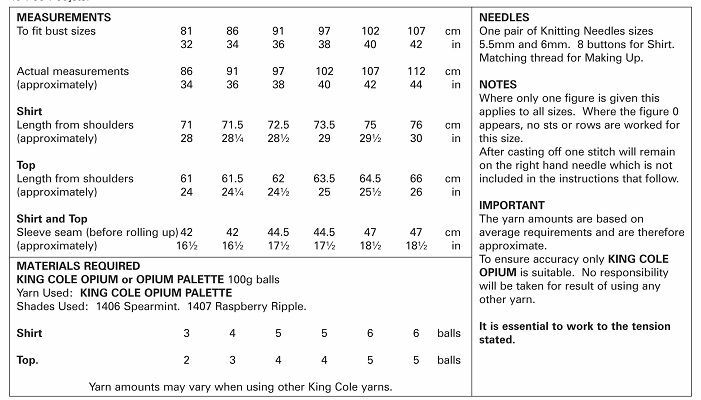 Knitting Pattern for Sizes 32in to 42in (81 cm to 107 cm). See table below for yarn required. Uses 5.5mm and 6mm knitting needles. 54% Cotton, 42% Premium Acrylic and 4% Polyamide. 100g = 250m.